Walking through the culinary and fragrance herb gardens of the Glencarlyn Library Community Garden in Arlington County in July and August, you will find a treasure trove of herbs to smell and taste. Basil, parsley, thyme, sage, lemongrass, stevia, lemon verbena, lovage, lemon balm, fennel, and more compete for space and sun in the Culinary Garden. Lavender, rosemary, sweet annie, oregano, pineapple sage, and anise hyssop reside in the Fragrance Garden and invite you to rub their leaves and smell their varied scents. This is the fourth in an occasional series of short articles featuring herbs grown in our Master Gardener Demonstration/Teaching Garden at the Glencarlyn Branch Library. Basil is our late summer subject. Read on to learn more about its background, growth habit, and needs, culinary, fragrance, and traditional medicinal uses. This is one of the herbs that is an ingredient for food or drink served as “tastes” at our annual AutumnFest celebration, to take place Sept. 16 in the Garden. Two taste-tested recipes are included below. All basils are tender annuals which are easy to grow, but are very susceptible to cold weather. They should be planted in late spring after all danger of frost is past and the nighttime temperatures are reliably above 65 degrees. To produce high quality basil, grow it in full sun in warm, well-drained soil with a pH around 6.4. On average, basils grows 12-18 inches tall and foliage color can range from green to purple. There are many named varieties. Italian (Genovese), Lettuce Leaf, Red Opal, and Thai are all popular sweet basil varieties. Scented basils include Lemon, Licorice and Cinnamon. Leaves may be used fresh or dried, however drying diminishes flavor. Ocimum basilicum, Sweet Basil has become a culinary classic. Its distinctively flavored leaves are added to many foods, such as Italian-style tomato dishes, pesto sauce, and Thai-style salads or meals. Basil’s essential oils and oleo-resins may be extracted from leaves and flowers and used for flavoring vinegars, oils, and liqueurs or for fragrance in perfumes, shampoos, and soaps. 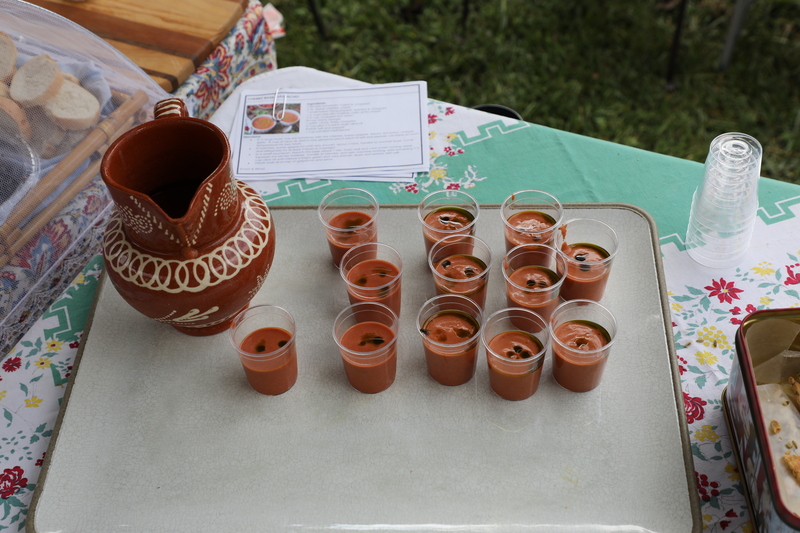 A tongue tingling taste treat: cherry basil gazpacho. In a large bowl, toss the tomatoes with the cherries, Italian pepper, bread, red onion, vinegar, garlic, ½ cup of olive oil, and a very generous pinch each of salt and pepper. Let stand at room temperature for two hours. In batches, puree gazpacho until very smooth, about 2 mins. Transfer to another bowl. Cover and refrigerate for at least 3 hours or overnight. In a small saucepan, blanch the basil, about 1 min. Drain well and cool under running water. Squeeze out excess moisture. Transfer to blender, and with machine running, add remaining 1/3 cup olive oil until mixture is bright green and very smooth. Strain and season with salt. Drizzle basil oil on top of gazpacho and serve. Fresh basil ready for cooking. This recipe will make enough pesto for four pounds of pasta. Combine the basil, garlic, and nuts in the bowl of a food processor and process until pasty. When it starts to get thick, add the oil in a slow, steady stream. Process until smooth. Add the cheeses and a generous amount of pepper and process again to combine. Add additional olive oil if you prefer a thinner consistency. The pesto can be added to hot pasta and served immediately or added to hot pasta and chilled. Refrigerate leftover pesto in sealed container or freeze. Add cherry tomatoes cut in half for color and flavor before serving. For a creamier consistency, add half and half or heavy cream to pesto before adding to pasta. 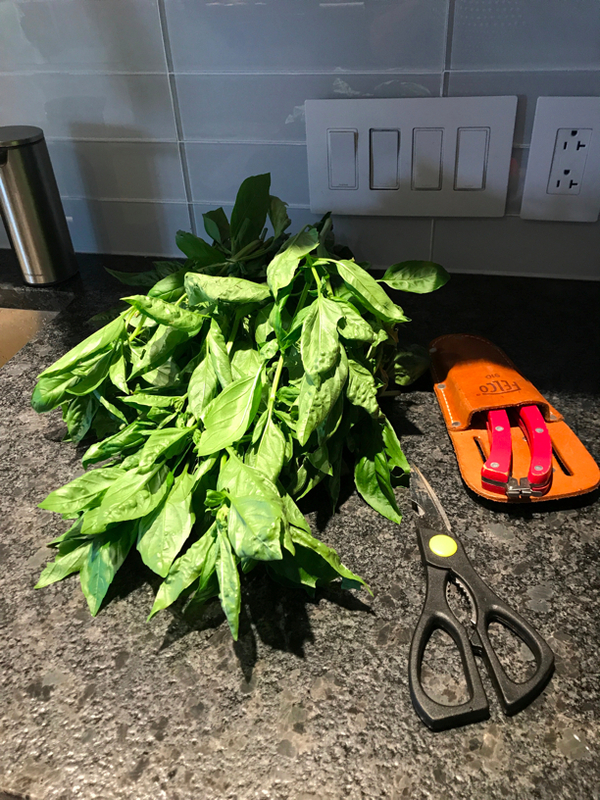 This entry was posted in Glencarlyn Library Community Garden, Herbs, Recipes and tagged (sweet basil), basil, gazpacho, Glencarlyn Library Community Garden, Herbs, Ocimum basilicum, pesto. Bookmark the permalink.